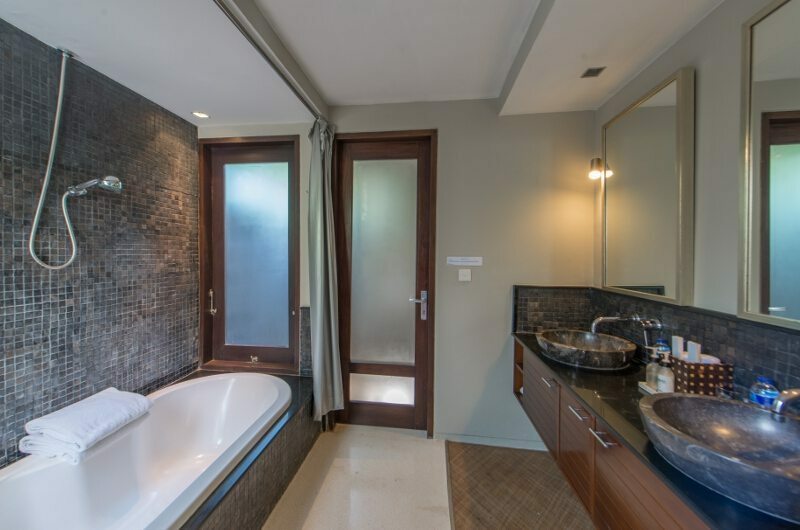 Chimera Villas offers five-star luxury accommodation and service in a very private setting only 5 minutes walk from the heart of the action in Seminyak. 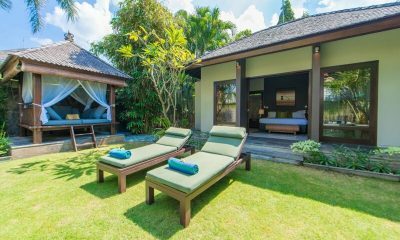 There are three private villas within the complex: Chimera Green and Chimera Orange each have two bedrooms, while Chimera Tiga is a four-bedroom villa. 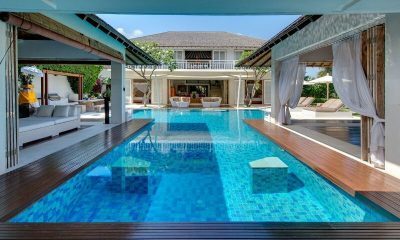 Each villa has a private pool and fabulous design. Given that the owner is a interior designer, the furnishings just add to the villas’ already fantastic layout. 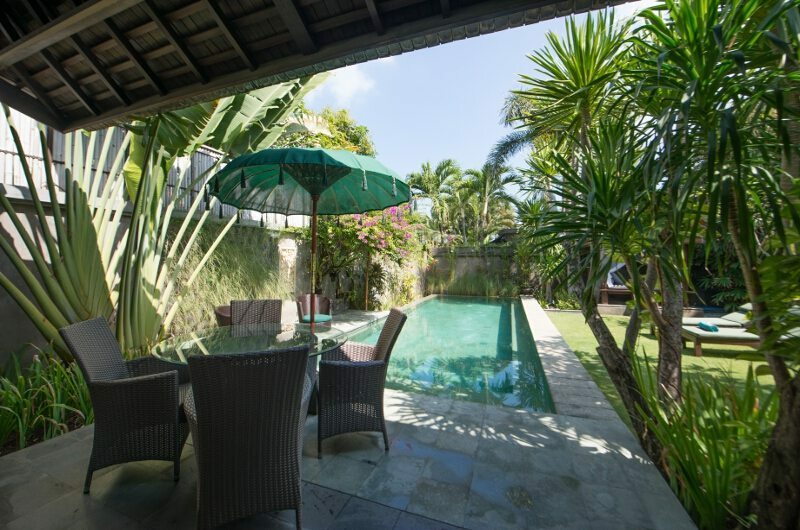 Chimera Villas is set in a quiet lane surrounded by several other villas within walking distance, just in case you have a larger group to accommodate. Read our full review of Chimera Villas. 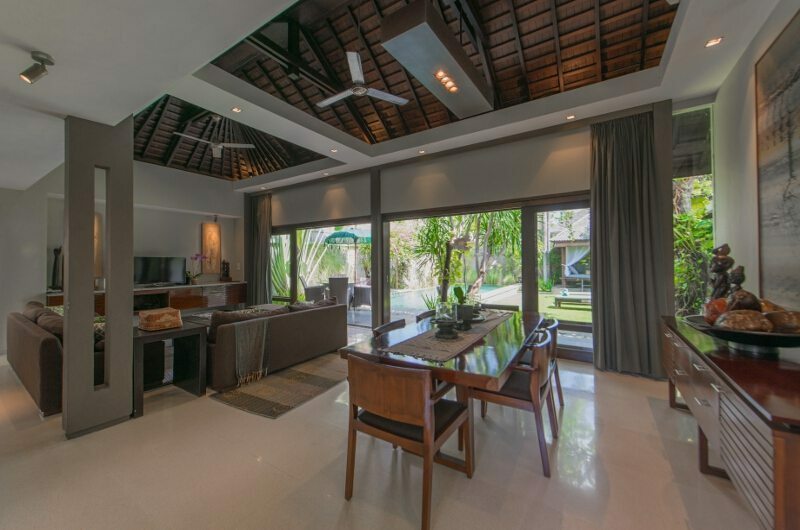 Upon entering the main foyer of the two bedroom villa in Chimera Villas, to the left is the kitchen with separate service entrance and a fully equipped western kitchen with bar style window to a separate dining area. The living room is fully equipped with a home entertainment system including DVD player, sound system and cable television. The 12 x 5 m lap pool is surrounded by a tropical garden landscape and a pool rain shower feature. Entrance is through a covered walkway, through the main door. 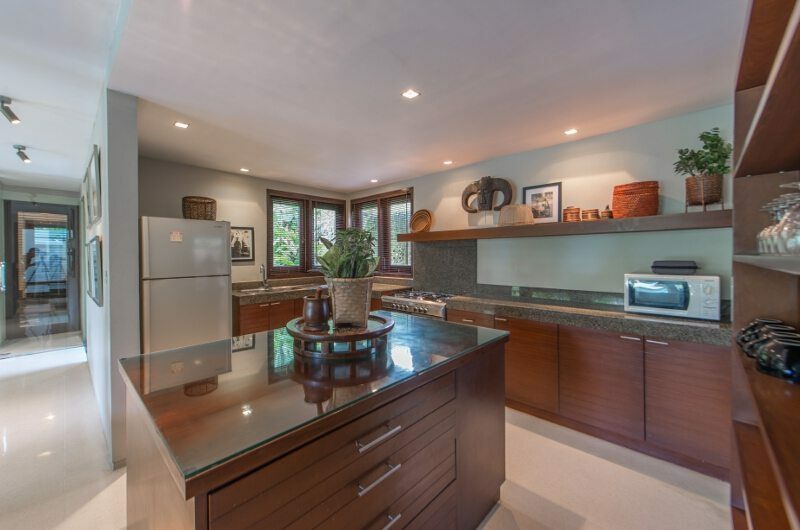 The foyer opens into the dining room and living room areas. 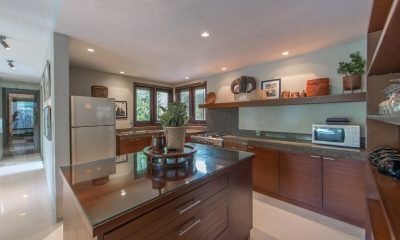 The fully modern kitchen is located on the left side of the living room with open-air guest powder-room/restroom at the end of the room. Opposite the kitchen is the laundry area. 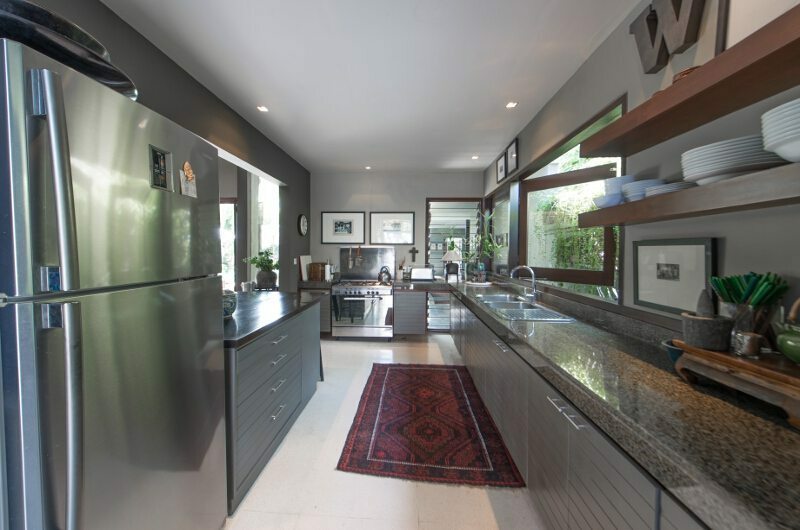 Both kitchen and laundry are accessible via a separate service entrance. The two bedrooms are located side by side to the right of the dining/living room. 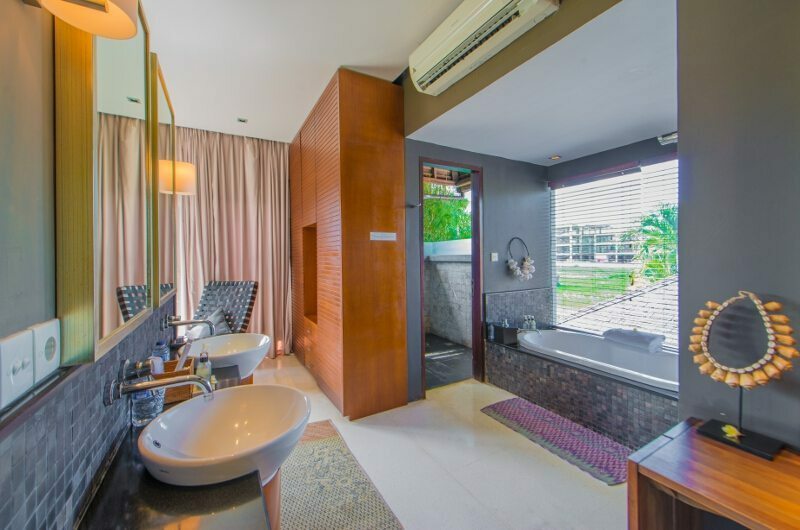 Both bedrooms have indoor showers, cable television and air-conditioning. 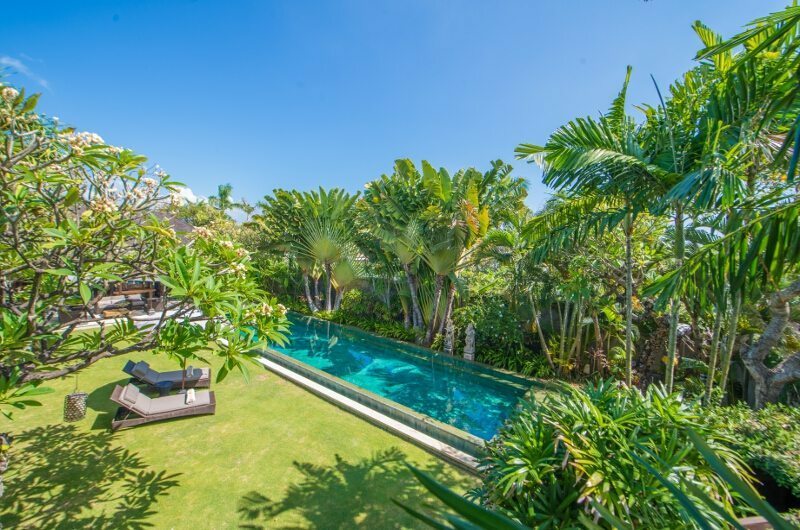 Both bedrooms face the 10x 5 m pool and its surrounding spacious tropical garden landscape. Entrance to the villa complex is through a secured gate to the parking area for four cars and management office to the left. A straight path to the villa entrance is through a massive wooden door leading to a covered gangway. 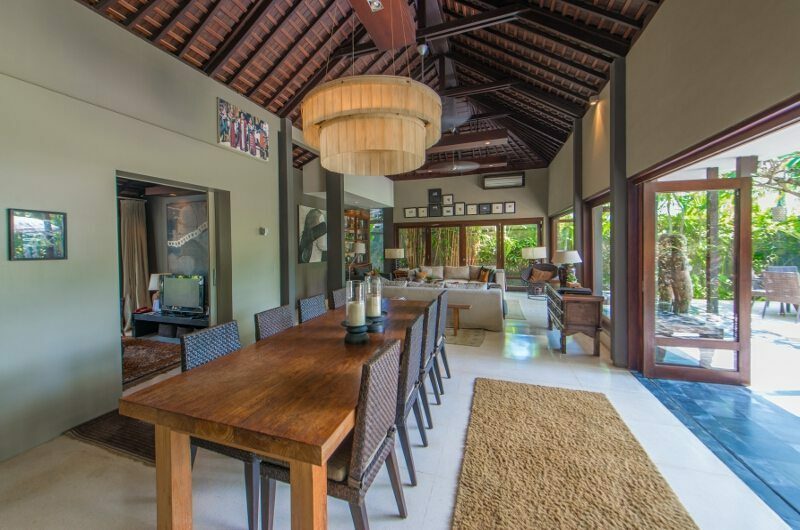 On the left side is a spacious open living and dining area, separate TV room and large modern kitchen, with separate entrance for service staff. 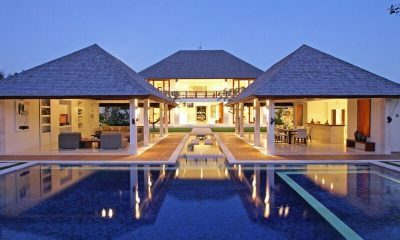 This villa has four bedrooms. 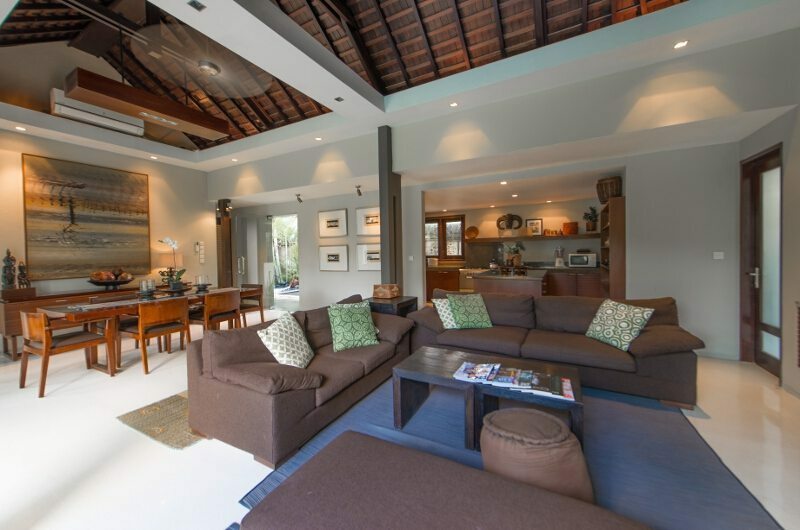 If you’re travelling with a smaller group, the villa can also be booked as a three-bedroom option. 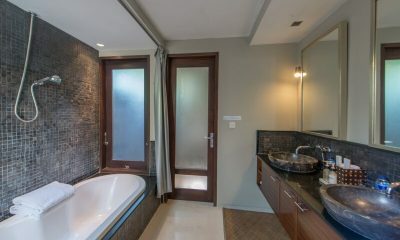 On the right side after entering the villa’s main door is the master bedroom which includes a king-sized bed, a TV and an ensuite bathroom with a bathtub and shower. 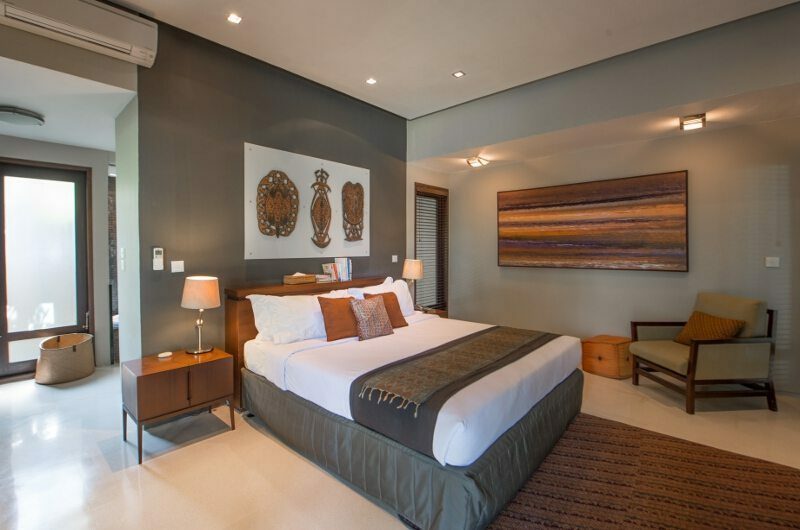 The villa has three guest bedrooms, all of them furnished with a king-sized bed and a TV. 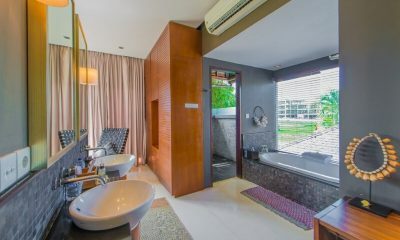 The rooms have their own ensuites with rainfall showers. Your stay in Chimera Villas is made enjoyable by the professional staff. 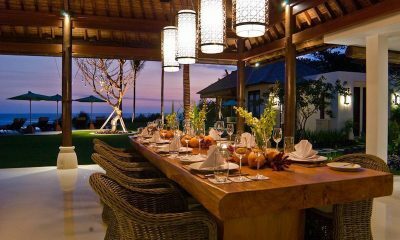 Chimera Villas’s staff have been professionally trained and will do their utmost to please with their warm and friendly Balinese hospitality. 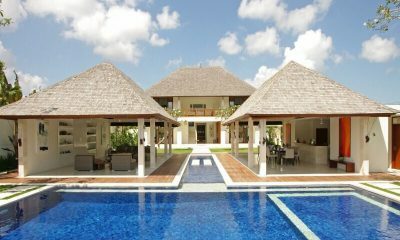 Chimera Villas’s experienced and knowledgeable manager is responsible for the overall operation of the villa. The villa manager will oversee and coordinate the staff and property and assist you during your stay. Chimera Villas’ chef can prepare meals from the villas’ priced menu with no extra cooking fee applied. If guests wish to order outside the villa menu, a cooking fee of USD $25 per cooking will apply. Guests will also pay for the cost of groceries plus a 10% grocery surcharge. Breakfast is also included and consists of: Pastries, breads, fruit platter, juice, tea & coffee. Chimera Villas includes 24-hour security at the estate’s main entrance. 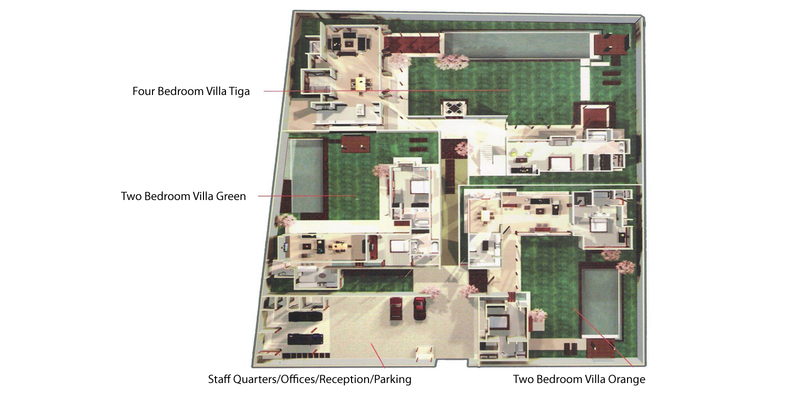 Chimera Villas are located just behind the restaurant district found on Jl Oberoi Rd. 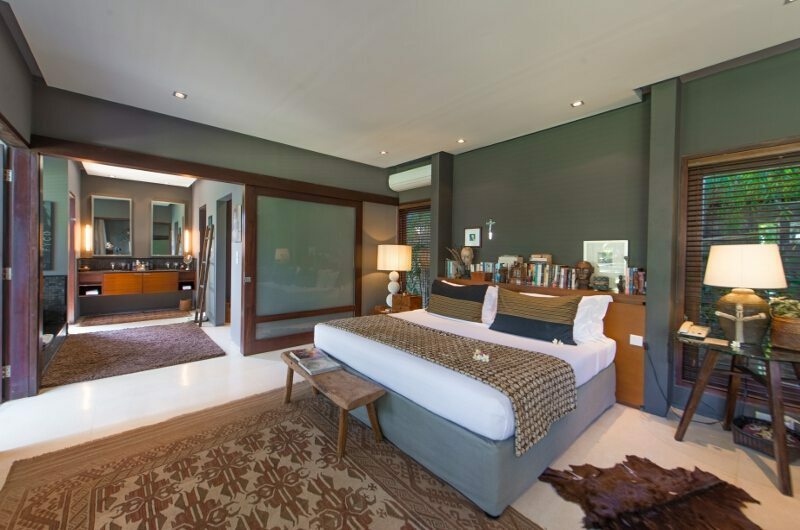 Accessed from either this road or from Jl Sari Dewi the complex is within walking distance of the Seminyak beach. 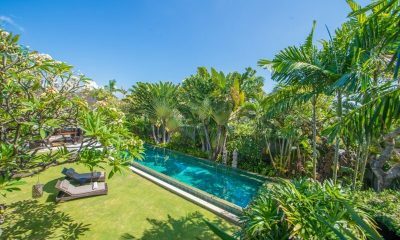 Chimera Villas is in the centre of what is now considered the prime villa district in Seminyak close to the well known Oberoi & The Legian Hotel. 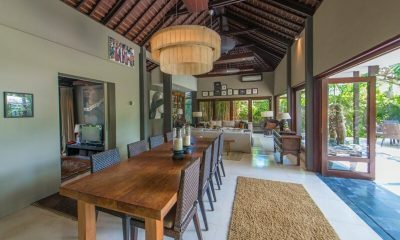 The villa is a 20 minute drive from the airport and a short walk to the Ku De Ta Restaurant and beach bar. It’s a short stroll to Petitenget and 15 minutes walk to La Lucciola restaurant. 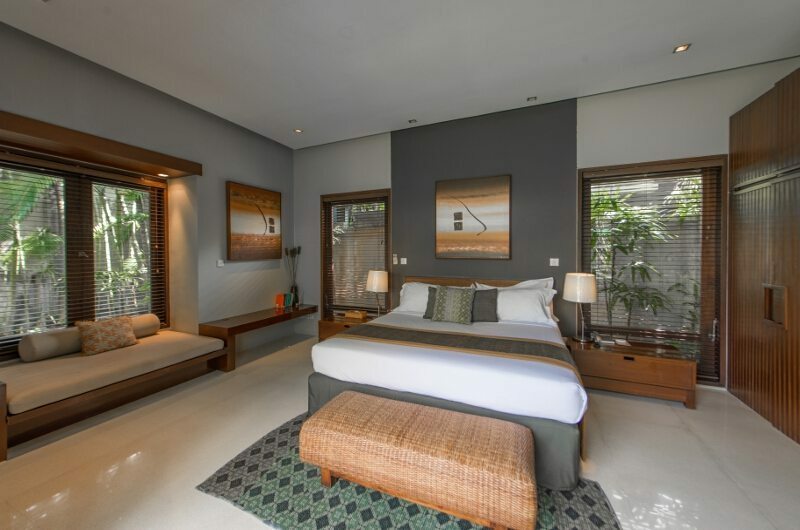 15 minutes drive to Kuta beach and Legian area. – plus everything Seminyak has to offer was just outside, so we could head out shopping or sight-seeing anytime. Rest assured it was tranquil and quiet, which was a concern i had when booking – though when we left there were some plans to upgrade the villa next door, so perhaps just check this won’t be going on during your stay. Would highly recommend! 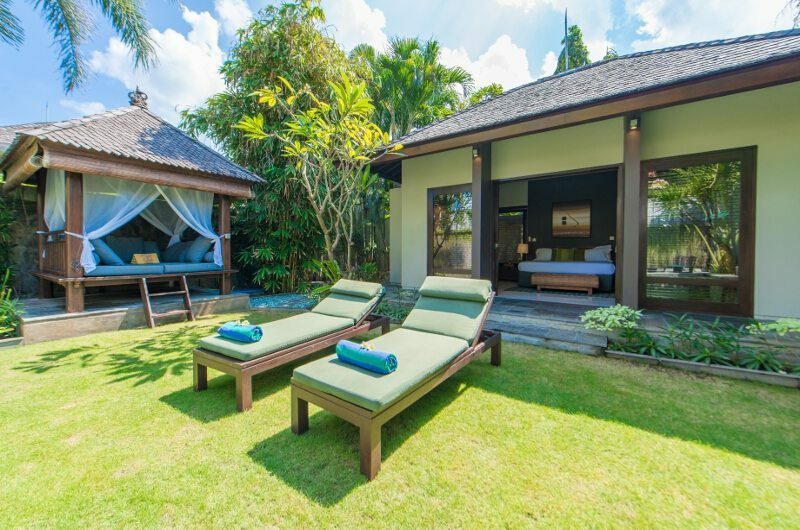 Lovely Villas and very well maintained. For the price it is exceptional value. The staff were really lovely and friendly. A truly wonderful stay. NB the villa isn’t easy to find so get extra directions if you are not suing ministry drivers. Once you arrive its very close to everything and you will walk everywhere. Just returned from an amazing trip celebrating my 40th birthday. 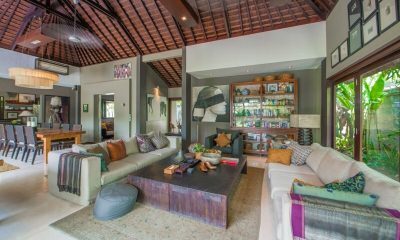 In a centrally located part of Seminyak, the villa was so much bigger than it looked in the photos and delivered a relaxing and five star experience. Nothing was too much trouble for the unobtrusive staff who take great pride in their work! Would love to come back again! Perfection! The villa was gorgeous, the staff were very sweet. The location was perfect for us. 5 minutes walk to eat street, or to the markets or to the beach. They gave us late checkout and the staff were always helpful to call restaurants or taxis. We ordered dinner one night from the in-house chef which was not great, I would recommend walking down the road to one of the great restaurants instead. Apart from that though, everything else was amazing. We had an excellent stay! From Arrival to departure we were very well taken care of by MOV team. The villa was kept in good condition (with exception of some TV breakdowns 😉 ) and overall the service level was great! Our request were met with immediately and breakfast was a unique affair. We will definately be back again! Better than the photos. Great villa in a really convenient setting close to cafes and shops. Well landscaped garden with a great pool. Large comfortable bedrooms, living room and dining and kitchen. Wonderful helpful staff who are super efficient. Very clean and well maintained. Breakfast were great and well presented as were the lunches we ordered. Relaxing and peaceful. Would go back again. Loved the villa. Staff were wonderful. Really well kept and clean, spacious and comfortable. Very close to Seminyak square yet very quiet and private. Very good breakfasts beautifully presented and good food to order. 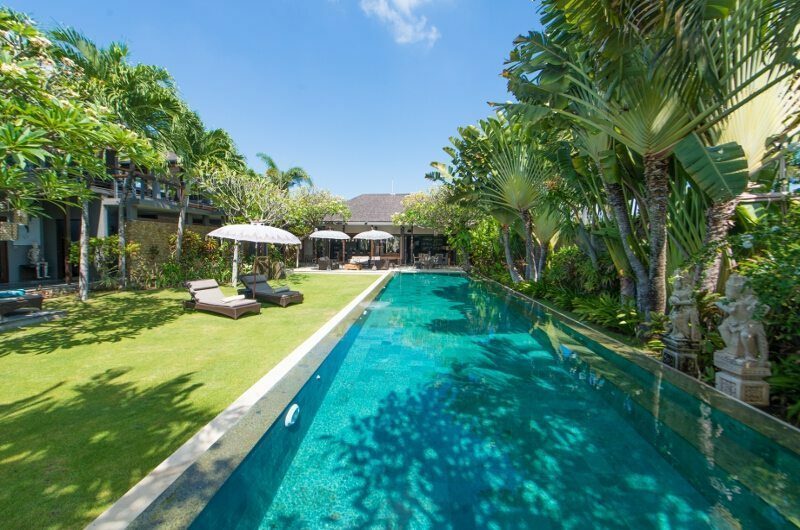 Great pool and a lovely landscaped garden. 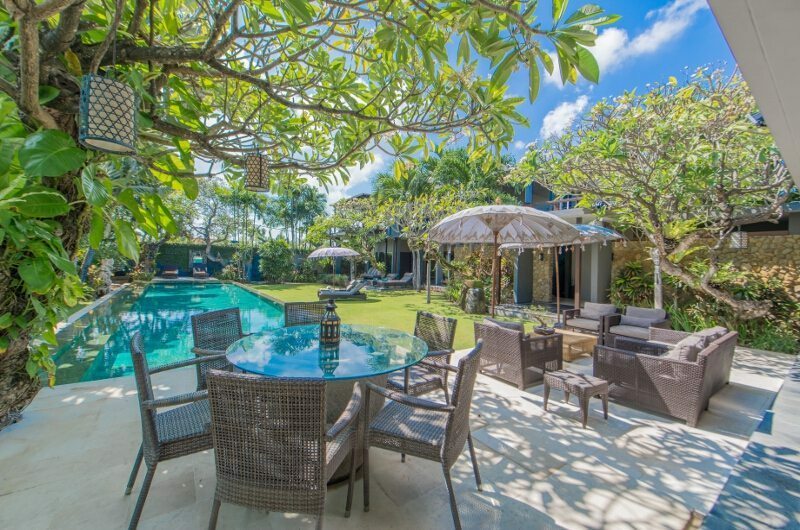 Chimera’s 3-bedroom villa is genuinely one of my favourite villas in all of Bali! 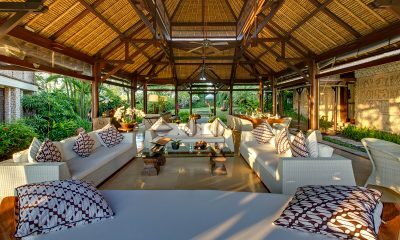 The décor in particular is very special – the perfect fusion of Indonesian art and contemporary luxury. 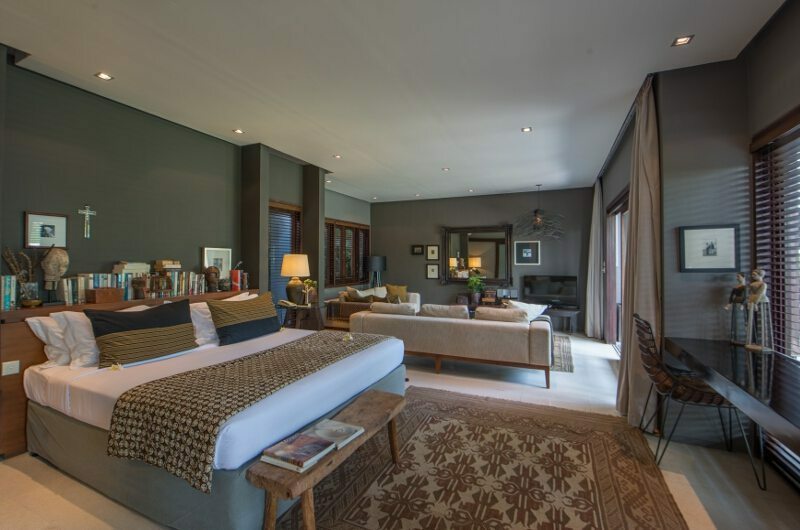 The master bedroom with it’s accompanying lounge area feels so warm and sumptuous. I spent hours leafing through books and marvelling the exquisite art collection. Chimera is the very definition of my dream holiday home away from home. Thank you too to the wonderful staff who looked after us during our stay – the team were so polite, friendly and professional – we were left 100% satisfied. 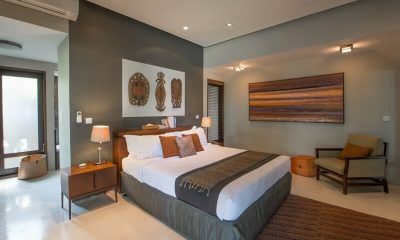 We recently stayed at Chimera the green villa, we had a fantastic 5 days. The villa was beautiful well fitted out large bedrooms and living spaces. The garden and pool space was perfect, great for the kids. The staff were fantastic so friendly and helpful. Our stay was amazing the photos don’t really do justice to this amazing villa a gem !! Ministryofvillas were very easy to deal with and everything was done as promised, a great experience all round thankyou. These photos just don’t do this place justice. 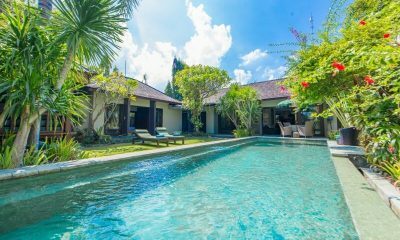 I have travelled to Bali 35 times and stayed in 5 Star but this little Gem tucked up in Seminyak is my new home for Bali get sways. This place was very clean, new furniture, the pool was great, breakfast what ever we wanted, the staff went above and beyond to help us they even dropped us off on there own scooter to the shops or pub and beach, arranged massages when ever we wanted. 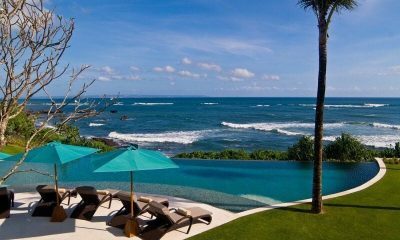 This is a must stay place for your next visit to Bali. 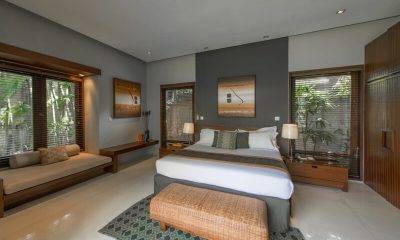 We have stayed in many Villa’s around Seminyak over the years and this ranks as the best at this price point. Its the small details in the garden and inside the home that really differentiate this place from the rest. 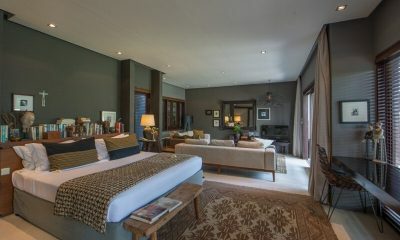 The rooms are generous, finishings are luxurious and homely. 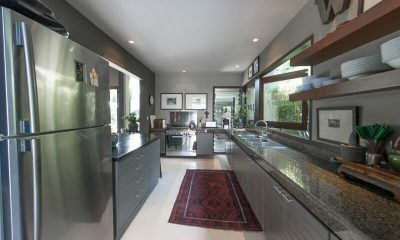 Its in a quiet location yet walking distance to all the cafe. A family or 3 couples will be very happy here. Great use of garden and pool capturing the sun all day. My only fault is the food which is cooked offsite and brought in, it was tasteless and generic. If we stayed here again I would find a chef for the week. 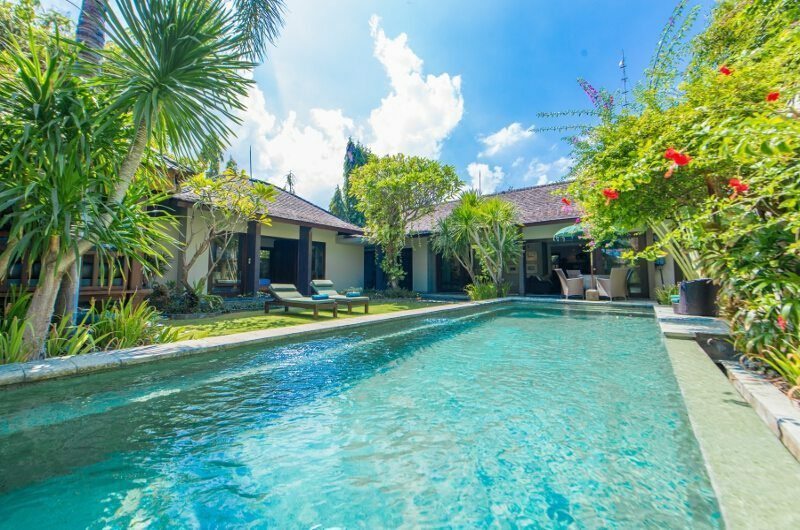 Have been to Bali a few times now and this has to be the best Villa we have stayed at so far. 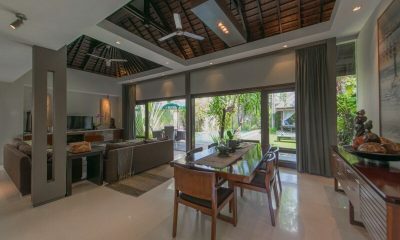 Situated a 2min walk down a private road from Ku De Ta (and hence the beach) it has to be in the best location. Because of the private road no bikes or cars are going past at all hours of the night….very quite! Seminyak flea market is 2 min walk away, shops are 3-5mins, restaurants 5-10min (depending on how far you want to go). 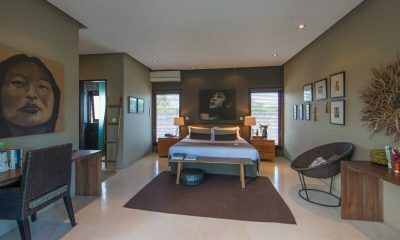 We stayed in the 3 bedroom villa-great set-up excellent rooms, all have walk in wardrobes, TV with cable & en-suites. 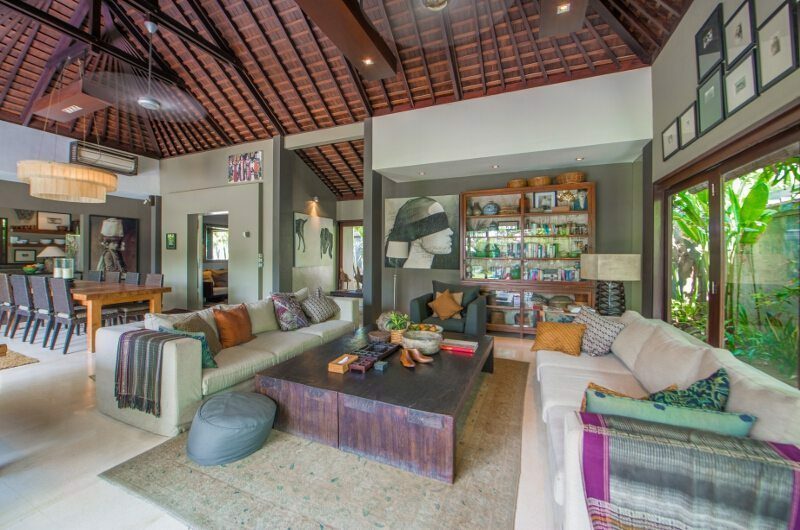 Decorated tastefully in the Balinese style with ample of books for reading the days away. Pool is about 20m so quick laps are possible and ledges running around half the pool in and L shape so our 2 year old loved it! Kitchen has everything you need so you can cook if need be, washing machine is a front loader so looks after you clothes but does take awhile. The staff are tremendous! The are always cleaning up after you and are quick to sort out anything you want. Can’t really state appropriately how good they are! The baby-sitter we used (Ta Tee) was very good with our little girl, older lady with a great smile that Ella took to straight away. Happy to recommend this place to anyone! My wife and I spent a most relaxing and peaceful time at Chimera Villa. We were picked up from the airport on time, and had no problems getting to the villa. 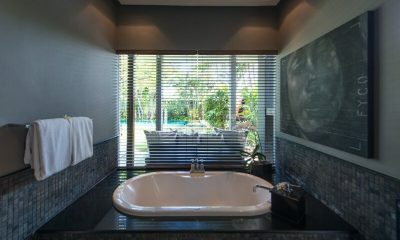 We stayed in the “green” villa and found it to be very spacious, clean, large and perfectly private. 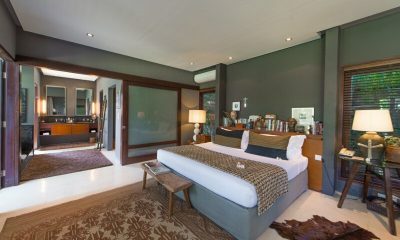 The rooms were meticulously cleaned each day, the pool clean and lawn groomed. We were able to tour the other two villas, and all three offer complete privacy, private pools, and vary spacious layouts. 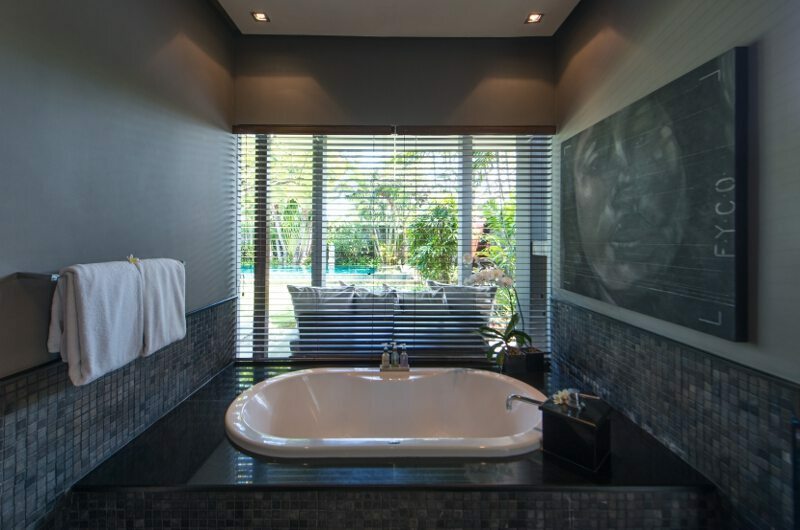 One very fun element: each villa has a different water feature – koi ponds, ponds with turtles, fountains. The location is amazing. You are secluded from all noise. You walk a short distance to the beach and all the shops and restaurants. 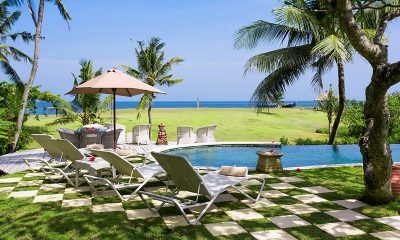 Although you are not directly on the beach, you do hear the soft sound of the Indian ocean while lounging next to the pool, or in the Gazebo. The staff is very friendly and were extremely helpful with our requests. We had breakfast prepared and delivered by the staff each morning. Food prepared to our request, very well presented and right on time. For 3 dinners we had the staff bring in food from local restaurants so we could eat our dinner poolside. The staff also arranged day trips for us to explore different parts of the island. We also enjoyed a couples massage next to our pool, also arranged by the staff. Highly recommend Chimera Villas, you will not be disappointed. Recently spent 10 nights at the chimera Villas. Great. Staff were excellent, friendly, but not to in your face. 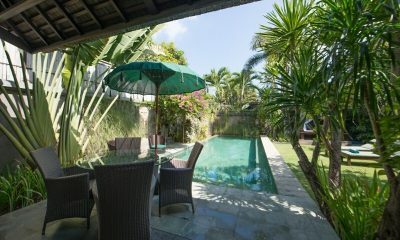 Stayed in Bali many times, this time we finally found a villa that was Quiet from traffic noise, or night clubs or bars with their loud music. Just a 5 minute stroll down the lane way and you come out at Ultimo Restaurant. Approx 10+ min walk to the beach. Fantastic. After sunset and a drink just walk down to the Padma and catch a taxi back after having dinner somewhere along the beach strip. The villas were great. Very clean, air conditioner worked perfectly. Pool great. I could not fault the place. will stay again. Believe me I hate the boom boom noises or motor bikes screaming past. This place was great. Breakfast is modest. but suited us as one normally eats way too much at a buffet. NO complaints. We stayed in the orange villa for 10 days with our 2 year old and our 10 month old in August 2012…the staff were fantastic including the security. 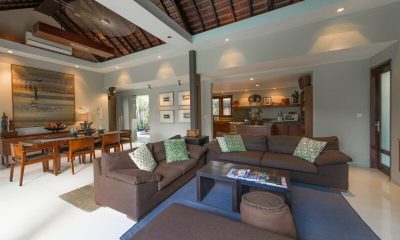 The layout of the villa was great and very spacious, well equipped through out. The pool was always clean and the lawn area was great to play with the kids. The villa actually looks better than the photos show. On a downside… the curtains in the main bedroom could be darker, and the blinds in the second bedroom needs replacing as they don’t close properly… lucky for us we don’t sleep in that much.. The second bedroom can get a be noisy at night as its the closes room to the driveway and gate, so you can hear the bikes coming and going and anyone talking. Breakfast is a bit basic not a lot of choice…but it was well cooked and always on time.